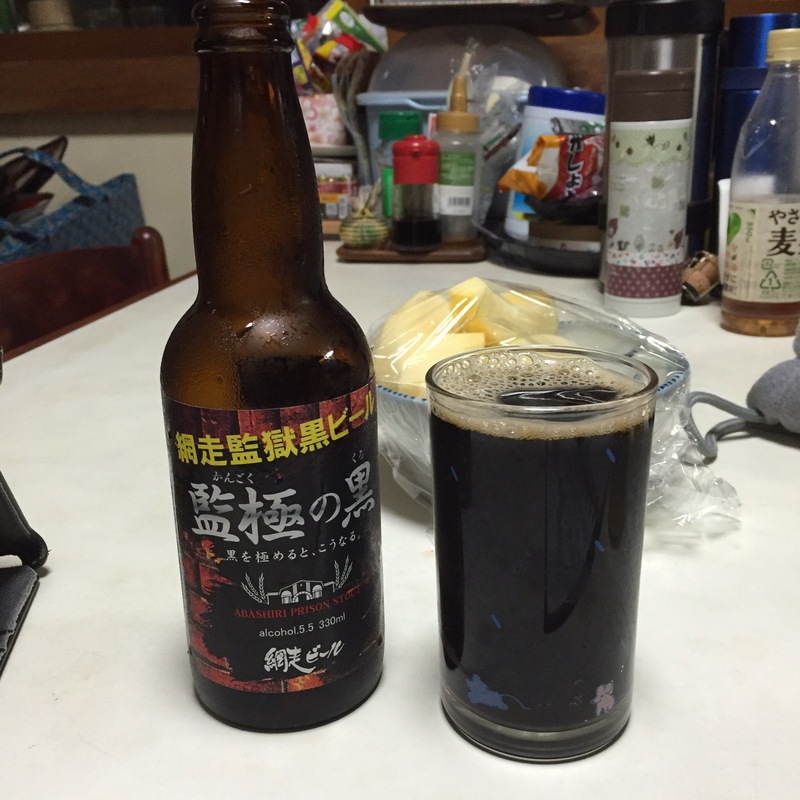 Abashiri Prison Stout is a 5.5% stout brewed by Abashiri Beer, BeerTengoku’s absolute favourite beer maker (also our readers’ favourite too, if the page view stats are to be believed. You weirdos). God, I’m so busy. Busy busy busy. Test season at work, and looking after an increasingly wiggly baby on my days off. Rob sends me beers and wiggles his eyebrows at me, hint hint, Joe, these ones aren’t on the site yet, if you’re free, hint hint, wiggle wiggle. Wiggle wiggle. As I watch my free time slowly ebb away, I shed a single tear at the thought that even the beer I drink also requires me to engage my brain and make notes for a review instead of letting me sink into oblivion. What’s the solution? Well, I could wait it out. Give it a few years and the boy can get me beers from the fridge. I’ll teach him how to make martinis. It’ll be great. I don’t think Rob has the patience to wait four years for a beer review, though. Two seems to be the limit. I could do what Rob does, and drink a gallon of coffee a day (at least, that’s how I think he manages to somehow fits 36 hours in one day). Or I could dig out the scribbled gibberish (scribberish?) in my notebook from a quieter time, a simpler time, a time when I made dad jokes solely to annoy everyone around me, unlike now where I make dad jokes because I am actually a dad. And also to annoy everyone around me. Let’s do that. The last one. What beer is left in my book? Ah. Oh. Hm. I suppose I deserve this. So they can make normal beers! Abashiri prison was a Meiji-era jail for political prisoners, and apparently the maximum-security wing is still in use today. Imagine being sent here in the 19th century, just because some pissant emperor has taken a dislike to you. Freezing in the dark. I bore this in mind as I poured this. It’s a thick black, with a slight head, that maybe changed colour?! Hm. It’s not very strong-smelling, unlike how I imagine a 19th-century prison. Tasting it, it’s kind of sweet, with a lot of bitter coffee acidity. It’s a little bit heady as well. That’s it, to be honest. Abashiri prison was infamous for its pitch-black windowless solitary confinement buildings. Also, 211 prisoners died of exhaustion constructing the facility. Great choice for a gimmicky nothing tourist beer, Abashiri.